In the 2005 photo, the order is Dave Beebe, Chris Beebe, and Alex Beebe. In 2013, the Vermont Fish & Wildlife Department began stocking muskellunge, or ‘muskie,’ along this upper stretch of river with the hopes of continuing to restore this native fish species. Alex Beebe’s catch is a sign that this conservation effort may be working. But Alex Beebe isn’t the first member of his family to achieve greatness with a rod and reel in Vermont. His father, Chris Beebe, is the current record holder for the largest muskie caught in Vermont. 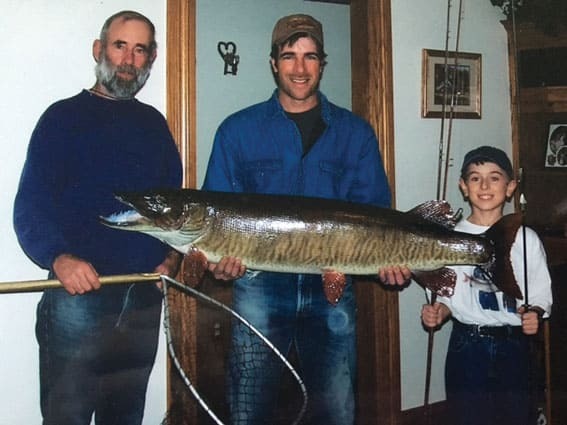 In August 2005, an Addison County angler broke the previous muskie record by one pound, a record that had stood for 27 years. But two weeks later, Chris Beebe’s catch shattered that record by more than seven pounds. Chris’ muskie record remains unbeaten today, at a massive 38 pounds, 4 ounces. His record fish was more than 52 inches long. Muskie are closely related to northern pike, with long rows of sharp teeth used to prey on smaller fish. They are renowned for their ability to attain massive sizes, with fish weighing in excess of 60 pounds from some of the more fabled muskie waters in other parts of the U.S. and Canada. This native Vermont fish disappeared from the Missisquoi River following a chemical spill in the late 1970s. Starting in 2008, the Fish & Wildlife Department began an effort to restore muskie by stocking 44,000 fish to the Missisquoi and by prohibiting harvest by anglers statewide. Muskie fishing is currently allowed using only artificial flies and lures in Vermont, and any muskie caught must be released immediately rather than harvested. One of the effort’s earliest and most passionate supporters was Chris Beebe’s father and Alex’s grandfather, Dave Beebe. Dave would regularly show up on the banks of the river to help department staff stock the young muskies. He instilled a love of muskie fishing in his son from a very young age. The muskie Alex Beebe recently caught on this new stretch of the Missisquoi was likely stocked in 2013 as a young, five-inch fish. By the time Alex briefly pulled it from the water this fall, it had grown by nearly two feet to 27 inches, demonstrating the extremely fast growth potential these fish have in appropriate habitat.